ANYONE arriving at Scarborough shortly after lunch yesterday and looking at a scoreboard that read 95-9 could have been forgiven for thinking that Durham had had a difficult time of it. Incredibly, though, it was champions Yorkshire who were at the crease and under the cosh in the hot August sunshine. But if there is one thing about Yorkshire it is that they never know when they are beaten. Tim Bresnan and Ryan Sidebottom added 67 for the last wicket, lifting Yorkshire to the relative respectability of 162, and Yorkshire carried that momentum into their bowling effort, dismissing Durham for 156 on a frenzied first day which they ended on 10-0 in their second innings. Sidebottom added 4-44 to his batting effort, Steve Patterson returned 3-16, and there was a wicket for Adil Rashid, his 400th in first-class cricket at the ground where he made his debut as an 18-year-old in 2006. It was a remarkable fightback by the hosts after a batting display characterised by poor shot selection in conditions that offered bounce and movement, but hardly in excelsis. Perhaps the clatter of wickets was a hangover from the Royal London Cup, where Yorkshire have just come off the back of seven matches in 11 days and Durham six in 13. Either way, it made for compelling viewing beneath picture-perfect blue skies. Before a crowd of 5,300, the largest for a Championship match in England this year, Yorkshire were soon in trouble after winning the toss. Andrew Hodd went lbw to Jamie Harrison in the fourth over, while Alex Lees chopped on to Chris Rushworth in the fifth. It should have been 16-3, but Andrew Gale was dropped on one by Scott Borthwick at second slip off Harrison. Dropping Gale at Scarborough is usually costly - he has hit five of his 19 first-class hundreds here - but he fell in the ninth over when Borthwick this time held him at second slip off Rushworth as Yorkshire slipped to 27-3. Jack Leaning edged a rising ball from John Hastings to Gordon Muchall at first slip, and Yorkshire fell to 54-5 when Gary Ballance also edged to Muchall at first slip off Graham Onions. It has been typical of Yorkshire for a while, however, that someone invariably digs them out of a hole. That someone has often been Jonny Bairstow, who hit 980 runs in 12 Championship innings before finally being taken by England. For a time yesterday, it looked as though that someone might be Glenn Maxwell, who was chosen in preference to Will Rhodes. Maxwell played well for 36, striking a couple of handsome boundaries off his Victoria team-mate Hastings, before he was sixth out with the total on 91. Maxwell tried to hook Onions but got an edge through to wicketkeeper Michael Richardson. When Rashid fell in Onions’s next over, caught at third slip by Jack Burnham on his first-class debut after he replaced Paul Collingwood, who was ruled out with a back spasm, Yorkshire were 94-7 and lunch was taken. There were more than a few mutterings among the Yorkshire members who strolled out to take a look at the sea during the break, although their mood would brighten appreciably later in the day. Liam Plunkett fell to the 10th ball of the afternoon session when he edged to Muchall at first slip off Rushworth, who struck again with his next delivery to have Patterson lbw. 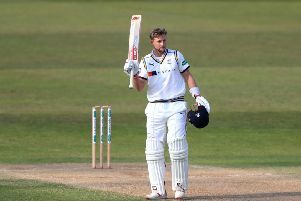 For the second time in three days, Yorkshire’s 10th-wicket added 67 as Bresnan and Sidebottom reprised the efforts of Matthew Fisher and Karl Carver after the hosts had slipped to 108-9 here against Somerset in the Royal London Cup. Bresnan, who hit a career-best 169 not out in the corresponding match at Chester-le-Street in June, sharing in a county cricket record stand of 366 for the seventh-wicket with Bairstow, was finally bowled by Harrison for 47. Yorkshire’s score was their lowest first innings total since they made 136 against Northants at Wantage Road last summer. On that occasion, Yorkshire hit back to win by 271 runs, and they proceeded to hit back in this one too. After Durham had advanced to 29-0, the hosts took three wickets in seven balls to set the tone for the rest of the day. Graham Clark slapped Bresnan to point, Mark Stoneman lofted Patterson to long-leg, where Bresnan judged a tumbling catch, and Patterson pinned Muchall first ball. Durham slid to 65-4 when Patterson had Richardson caught behind off an inside edge, and to 66-5 when Burnham was bowled by Plunkett for a fourth-ball duck. Sidebottom trapped Borthwick before having Hastings held at first slip, Rashid pinning Harrison to record his 400th wicket. Sidebottom ended the innings by having Ryan Pringle caught for the top-score of 40 by Rashid at deep backward-square, followed by the wicket of Rushworth, taken at third slip by Maxwell.